Sometimes the cup is indeed half empty and sometimes there are no positives to be taken from a heavy defeat! For the ‘Ensians at Northallerton on Saturday, better to own up, accept the result, have a reflective Sunday and “come back” to prepare for the next match. The afternoon began sombrely, with weather mirroring the mood of the minute’s silence in respect of last week’s terrorist attacks in France. Northallerton kicked off, ‘Ensians secured the ball, made slow progress through the forwards, then knocked on. From the scrum, the home no. 9 broke blind and brought his right wing into play. The visitors were soon on the defensive and this was to be the story of the half. It was quickly apparent that Northallerton gained territory more easily than the men in blue, who found it difficult to make any ground going forward. Northallerton pressed on their opponents’ line, ‘Ensians defended stoutly and turned the ball over. The clearance kick failed to find touch, the ball was run back and it was defence again. ‘Ensians gave away a penalty for an offence at the ruck and Northallerton kicked to the corner to keep up the pressure. The visitors had spent virtually all the game so far in their own half/22, but against the run of play broke out and ran well through Josh Howarth to obtain a glimpse of the home try line. This was short-lived and Northallerton cleared with a good touch finder. Play was scrappy and what turned out to be a feature as the game wore on was an ‘Ensian failure to catch a high Northallerton kick ahead and concede a home side put-in. Whenever the visitors made any ground, the advantage was immediately lost and play returned to the ‘Ensian 22. From a relieving penalty kick to touch to gain territory, ‘Ensians offended and were again on the retreat. However, a subsequent tap penalty by No 8 Arbuckle allowed Luke Cowdell a run and Connor Bateman continued the attack. However at the breakdown yet another penalty was conceded and ‘Ensians were beginning to wonder how they could “legally” compete for the ball. A short time later “off the feet and over the top” said the ref. and the Northallerton fly half punted the opposition back into their 22. Hard work for the ‘Ensians! An attempted break by Luke Cowdell was spoilt by “crossing” and with all their possession and territory, Northallerton must have regretted not having any points on the board. However, after 25 minutes, they scored from an easy run to the line and, with the conversion missed, had 5 points to their name. ‘Ensians secured and retained possession from the restart and after a loose pass threatened the good work, a good run by Greg Jones helped the cause, but the ball was then lost and Northallerton had the scrum. The struggle continued with a further penalty awarded to the home side. Touch was missed, but an ‘Ensian knock-on gave the ball back to Northallerton. Sam Feathersone was showing up well in the lineout, but his efforts foundered on ‘Ensians’ inability to control possession. For once, Northallerton were turned over and a good run by Howarth came to nought with a loose pass finding the opposition. The penalty count against ‘Ensians was becoming a serious handicap and just on the stroke of halftime the first attempt at goal gave Northallerton a further 3 points, to take them to the break 8-nil up. It should have been more and if the visitors could now play (and stay!) in their opponents’ half of the field, then the game surely was not lost by any means. Conceding penalties was costing ‘Ensians dearly in terms of territory if not points and needed to be addressed. Second half all to play for. A quick turn round on this very cold day was sensible for everyone, but from the resumption, Northallerton were in the ascendancy, pushing the ‘Ensian scrum back with ease and again finding great field position. Rain was beginning to fall and conditions probably suited no-one, certainly not wingmen, who looked colder that the spectators! Mistakes abounded, with touches missed from ‘Ensian penalties, dropped and fumbled ball and ever more penalties awarded against the visitors. Northallerton were also offending though and Connor Bateman made a couple of very good relieving kicks. Westland and Cowdell tried to make some headway through the middle of the park, but it really was hard work. The Northallerton pack were doing much as they pleased now, walking/running ‘Ensians scrum back with total ease and it is fair to say that with so many ‘Ensian players having off-days in the same game, collective effort and cohesion went by the board. After being warned for persistent offending, ‘Ensians conceded a penalty try and 7 points were added to the score line. The referee had a chat with both skippers, which held the game up and did little to help continuity. One felt for the ‘Ensian halves who, with slow ball, poor ball and not very much ball, had little chance of exerting any control or shape on the game. Northallerton were now totally dominant up front keeping the visitors penned in their own 22 and causing them much disarray. A “walking” maul put Northallerton a further try ahead and with the conversion missed, the outcome looked as though it would be 20 points to nil. With all three subs used and reused, ‘Ensians (and indeed Northallerton) were waiting for the final, relieving, whistle when, much to everyone’s surprise, the visitors broke away and the skipper scored wide out. 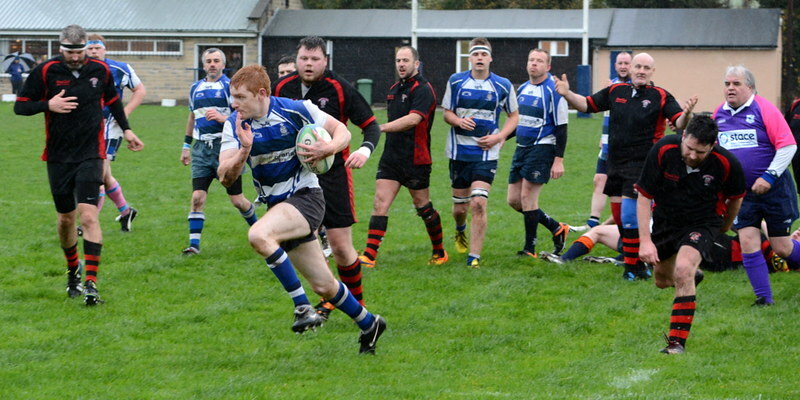 The conversion attempt failed and proceedings came to a close at 20-5 to Northallerton. A bad day is harder to accept when you know you can, and indeed usually do, perform so much better. Ah!! The cup can begin to fill up and a positive is there to be grasped. You could argue a good case for summer rugby, but we have to contend with winter and so, onward and upward to next week. YMCA aren’t known for travelling, but with the wifes of the players been treated to a day round otleys charity shops & a coach laid on [ they know how to treat their woman in Huddersfield ] it was game on. Huddersfield were down as “ more of a vets team “ but apart from the odd one, they didn’t smell of formaldehyde or wee !. George Duncan was a no show ? but all the rest turned up including pete [ did i tell you about when i scored a hattrick ! bla ! bla ! bla ! ] gillson, who filled the problem – standoff role. The front row consisted of tony myers, ben Tetley & ali fothergill. captain fantastic – brett van tenniswood & dean bailey [ gets better with every game ] filled the second row. The back row was cheesy, matt Edmonds & salvation armies most admired trumpet player [both men & woman ] – dan rideway at eight. Cameron whinstanley was at nine, with pete gillson at ten. Mike Cunningham moved from backrow to centres, with joe tindall & Jamie kenworthy was on one wing with james burgess dropping to full back for paul tosney, dropping from the forwards to take the other wing. Mark elam was on the subs bench after a hard day parking cars ! The game plan was to kick them into their own 22 & move the forwards around the park. The game started with Huddersfield kicking to ensians, for dean bailey to take it straight back to them. Old hand pete gillson used mike cuningham to make some hard yards, then kicked hudderfield into their 22. After a good steal from the line out, the driving maul sent Huddersfield back for cheesy to break off & score to make it 5 – 0 on 4 minutes. With dean & brett catching most kick offs to set the ball up, & gilly kicking huddersfield back into their own half , Jamie kenworthy, james burgess & paul tosney chased & put hudds back three under pressure, hudd were struggling to get any rugby together in the very wet conditions. Dean & brett line out was on top form [ when ben could get it in straight ] , the driving maul was causing huddersfield problems & this time it was ali fothergill whos powerfull run dispersed the defence to score, but with no conversion it was 10 – 0 on 12 minutes. Huddersfield were trying to put some rugby together, using their big runners, but matt Edmonds & cheesy were the pocock / hooper combination who were there to steal the ball at evey opportunity, with gilly to kick them back into their own half again. From another good line out / drive, pete gillson did one of his old trade mark shimy & goes, but with the nicotine cutting off the blood supply to his lungs, he had to pass inside to the man of the match cheesy to break away & score, & with conversion it was 17 – 0 on 25 minutes. The rest of the half was Huddersfield pounding ensians line & gilly kicking them back at every opportunity, with the tackling of cheesy, matt Edmonds, dean bailey & prop tony myers catching the eye. In the second half , YMCA changed their tactics by keeping the ball close & driving on through their forwards. When they couldn’t break through, they tried to kick long, but james ,Jamie & paul ran it back to cause problems. The scrums were solid with ben tetley taking his fair share of hudds ball & dan ridgeway picking & going with every chance created. Cameron had a good game at scrumhalf with dan looking after him & made a few breaks, but didn’t quite know what to do when the space ran out, but he gets better every game,.Joe tindall made some good yards, but after throwing a dummy & making a break was flattened after holding on to the ball a bit too long ! after another ali fothergill powerfull run, try scoring trumpet tickler dan ridgeway dived over to make it 22 – 0. Ymca never gave up & came straight back at ensians, & after a series of drives dived over for a deserved try to finish the match. A good game played in good spirit in bad conditions & congratulations of the week go to my old mate pete gillson who put his boots on & managed the game for 50 minutes before hobbling off with new tales to bore the white swan faithful (& simon wilson with)!